Do Students of Color Profit from For-Profit College? A post-secondary education is increasingly necessary in order to obtain a high-quality job and a lifetime of financial security and wealth-building opportunities. Many students finance their education through student loans because they see its value as an investment in their future. However, according to the research presented in this paper, the value of that investment is questionable for those students enrolled in for-profit colleges. Although historically students almost exclusively attended public and private, non-profit two- or four-year institutions, in the past forty years—and especially over the last decade—more and more students have enrolled in for-profit colleges. The for-profit college industry argues that they provide access to higher education for students that cannot be absorbed by other institutions with more limited capacity and that they are also able to quickly develop programs that are responsive to the changing demands of employers. This paper examines the central question of whether the additional access provided by for-profit colleges actually translates into increased opportunity and financial security for these students. Special attention is given to the African-American and Latino students who enroll in these schools. 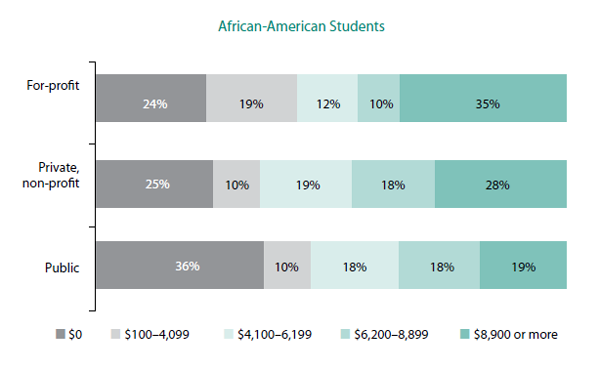 Students of color face significant barriers to achieving educational parity (and thus, to a great extent, income and wealth parity) with white students. College application, acceptance, matriculation, and graduation rates for African-American and Latino students lag those of white students (Aud et al., 2010). For-profit colleges have positioned themselves as a means for traditionally underserved students of color to achieve educational success and thus to increase their ability to earn higher incomes and build wealth. If these schools do not engender better outcomes for their students and instead merely saddle students with debt, then the access these schools provide could prove to widen existing income and wealth gaps, rather than to narrow them. Black and Latino students enroll in for-profit colleges at much higher rates than other students, which puts them at risk of high student loan debt, default, and failure to graduate. Over one-quarter (28%) of African Americans enrolled in a four-year institution attend a for-profit college, compared to just ten percent of whites. 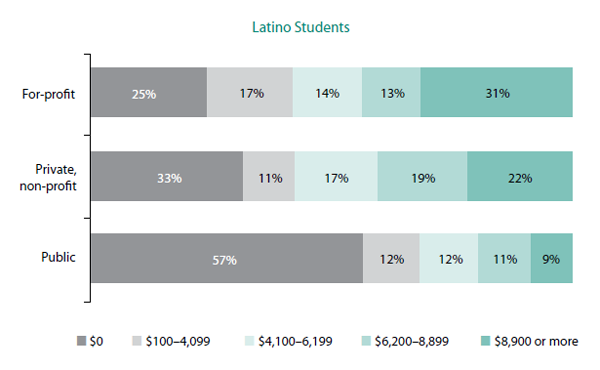 Latino students are also more likely to attend a for-profit institution than a public or private, non-profit school relative to whites. Students who attend for-profit colleges are more likely to need to borrow for their education, and tend to borrow more than their peers at public or private, non-profit schools. Students who attend for-profit colleges are also less likely to graduate, more likely to default on their student loans, and may face poor employment outcomes. An African American student at a for-profit college will borrow at the highest rates almost twice as frequently as African American students at a public college (35% vs 19%), regardless of income. Latino students at for-profit colleges borrow at the highest rates almost three times as often as Latino students at public schools (31% vs 9%), regardless of income. African Americans and Latinos attending for-profit colleges are far less likely to graduate than their peers at other schools; nearly eighty percent of African American and two-thirds of Latino students do not complete for-profit programs.